Students worked in teams using a semester's worth of logic to figure out the combinations to safes. Photo by Carl Socolow '77. The idea that students take a quiet final exam, hand in their tests, whisper “goodbye” to their professors and then slip away into the summer—possibly forever into postgrad life—can be disheartening. So Professor of Mathematics Lorelei Koss decided to slow the whole thing down and make it more personal, for both her students and herself, by crafting a different kind of final exam experience. “My first idea was to create an escape room, but I thought that the college would not approve of me locking students in a room,” Koss says of one possible approach to her Discrete Mathematics 211 final. 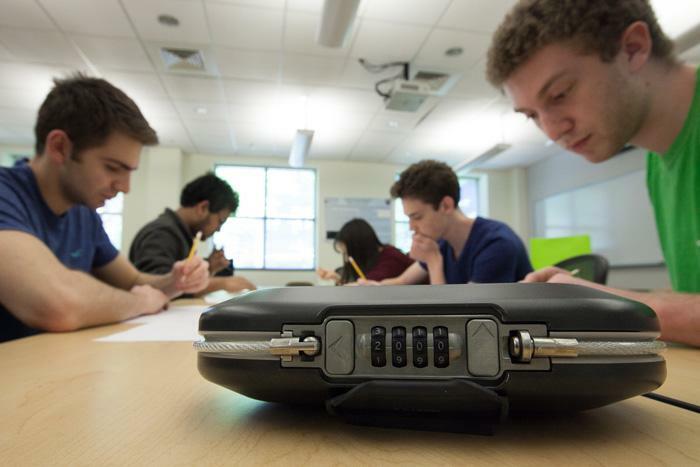 What she did instead was buy several small combination safes and dream up a new kind of exam: a series of logic puzzles using what students learned in class to slowly reveal the safes’ combinations. Koss’ inspiration was the article “Final Exams or Epic Finales” by Anthony Crider in the Chronicle of Higher Education. Crider’s experiences with “whispered goodbye” final exams struck a chord with Koss, and so she planned her exam around bringing students together instead of isolating each of them in the usual cone of silence. If Huddy’s reaction is any indication, future students will thank Koss for her efforts.